1/43 scale factory dealer Paul's Model Art Minichamps Bentley Azure. Right hand drive. These were sold direct from Bentley, and have been long sold out. Great condition, nice collectors model. Beautiful Bentley Azure convertible in blue, display screw in cardboard worn, will secure car in bubble wrap in box. Box wear, car like new, no issues. Unique lavender color, perfect Arnage, by Bentley.in box, no issues, box wear. IT IS IMPORTANT TO INSPECT ALL PHOTOS CAREFULLY. WHAT YOU SEE IS EXACTLY WHAT YOU WILL RECEIVE. IF THERE IS A BOX, PAPERWORK, ACCESSORIES ETC…IT WILL BE PICTURED. IF YOU DON’T SEE IT THEN IT’S NOT THERE. And now, we hope to have the chance to prove we are the best to you! Competitive Pricing and Unrivaled Selection We are the number one direct distributor of diecast model cars in the USA, so we are able to provide very competitive pricing. Nice car in box no issue, silver fastback. 143 scale. This was the first Bentley Dealer Edition of the Continental GT series and the first diecast model of the Continental GT ever. Model features the Left Hand Drive (LHD) version of the CGT. The Bentley Part Number for this model is: BL-315. MINICHAMPS 2003 Bentley Continental GT (Red) 1/43 Scale Diecast Model NEW, RARE! Ultra-rare, Limited Edition! Highly collectible precision diecast scale model released by Paul's Model Art (Germany). Sold "as is". Actual model for sale is mint new and has never been removed from its showcase. MINT IN BOX. BENTLEY LIMITED DESIGNER SERIES. Paul's Model Art. very scarce and long out of production. outer box is near mint plus to mint. includes interior molded clear plastic protective cover. BENTLEY ARNAGE T. 1/43 SCALE. BOX IS IN GOOD CONDITION. NIB =N EWI NB OX! ALSO NOTE, THAT I AM. THIS 1:43 SCALE MODEL WAS RELEASED IN 2006 AND IS NO LONGER AVAILABLE AT THE DISTRIBUTION LEVEL AS THESE HAVE LIVED THEIR LIFE EXPECTANCY AND HAVE SOLD OFF. MINICHAMPS Bentley Continental GT, Yellow 1:43 Now Sold Out! (NOW SOLD OUT) SWEET LOOKING BENTLEY-ouch! VERY NICE CAR AND ADD THIS TO YOUR COLLECTION! THIS IS FROM 2011 AND IS THEIR MULSANNE, WITH A RED EXTERIOR AND A BEIGE INTERIOR. NIB =N EWI NB OX! 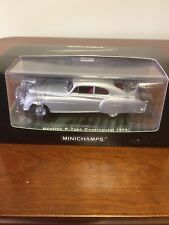 1/43 Minichamps Dealer Bentley GTC Gray W/display New! Sold Out! 1/43 scale Minichamps, built for dealers only model Bentley GTC. This model is in gray and is limited in quantity. On display base. New, never displayed. VERY NICE CAR AND ADD THIS TO YOUR COLLECTION! Nice to own! Excellent Replica.Very Collectible. Very rare diecast model. Limited edition 4032pcs. Not new but like new, excellent condition. WHAT YOU SEE IS WHAT YOU GET. NIB =N EWI NB OX! Part # BL315. Sold through Bentley Dealers. Original Bentley box has a few shelve marks. THIS IS FROM 2011 AND IS THEIR CONTINENTAL GTC MODEL IN BREEZE THE INTERIOR IS IDENTICAL IN COLOR. BREEZE ON BREEZE IF YOU WILL! NIB =N EWI NB OX! The new model Mulsanne was released in this color Light Gazelle. 2010 Bentley Mulsanne #BL285. It was sold only at Bentley Dealers. NIB =N EWI NB OX! THIS MODEL CAR IS SOLD OUT WORLDWIDE AND IS THE BREITLING MODIFIED CONTINENTAL GT WHICH WAS MODIFIED FOR THE ICE AND PROVED VERY SUCCESSFUL IN THESE MODIFICATIONS FOR THE ICE AS IT HOLDS THE CURRENT HIGH SPEED RECORD ON ICE! Broken mirror and distressed case.